The Elbphilharmonie, the townhall, the harbour and the shopping area Jungfernstieg …all these places of interest are located in walking distance. Our holiday apartments and guestrooms are right in the centre of the historical part of Hamburg close to the waterfront, quiet but surrounded by many cafés, restaurants and places of interest Do you rather stay close to the exhibition centre, or the main station or in the very popular tredy districts... no problem whatsoever. We can also offer your reasonably priced apartments and guestrooms in these areas as well. 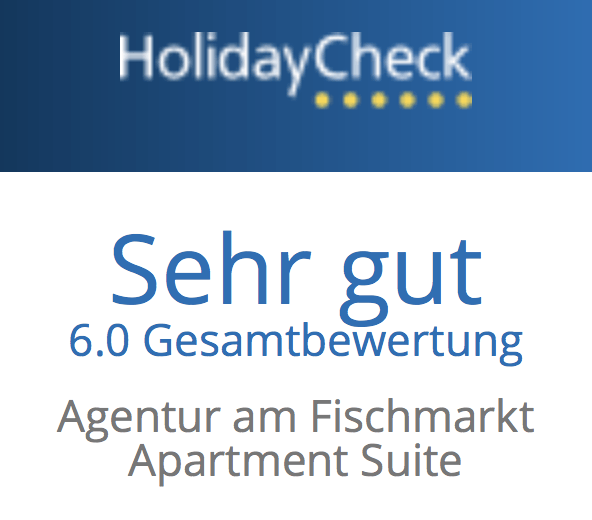 No hidden costs: The prices of our apartments in Hamburg are full prices. There is no no agency commission and all additional costs such as electricity, water and heating are included in the price. Free Wi-Fi and the provision of kitchen utensils, toilet paper and dishwashing is self-evident for us. For longer stays of 14 days or more, we offer weekly cleaning without extra charge and allow you to use the free washing machine and dryer. We are happy to fulfill your special wishes: You need a child's bed, a high chair, an iron, a hairdryer, a DVD player or a microwave? Do you want to safely park your bicycle or need a garage for your valuable motorcycle? Do you want to check out later or arrive earlier and need a free luggage locker? 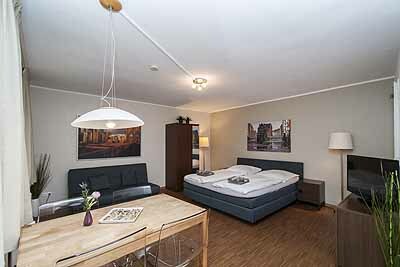 You arrive in Hamburg at night and would like to get your apartment after midnight? No problem, everything is settled. Information around Hamburg: We will gladly help you with all questions about your stay in Hamburg and give you insider tips. Where can shopping on Sunday? Who has the best rolls? Where can you make the most beautiful harbor cruise? Which city tours are recommended and what exhibitions are currently running in Hamburg? In which restaurants can you eat particularly well? What does Hamburg have to offer for children? Where can you borrow bikes and which excursions are recommended for cyclists? What are the opening hours of the Sternwarte? Which swimming pools are there and how can you get to the beach the fastest? Ask us holes in the belly because we are happy to show you our beautiful city of Hamburg!. This is a nice apartment for two up to four people. 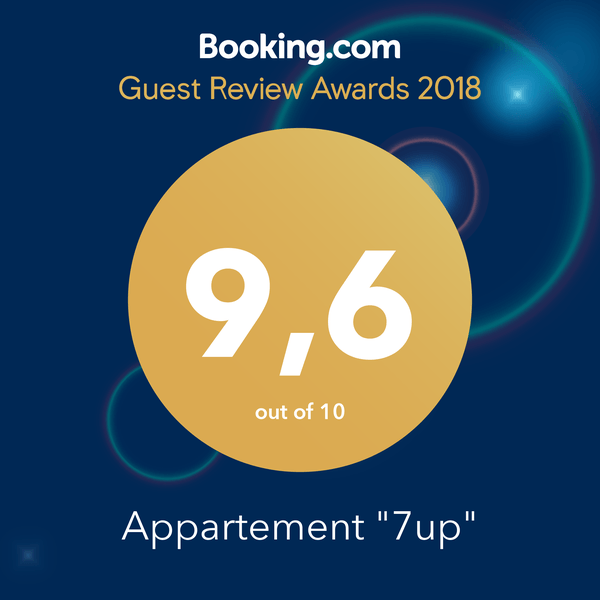 It's comfortably furnished with a double bed, wooden parquet fooring and a small but fully equipped kitchen with fridge, coffee maker and water kettle. Two more people can sleep on a convenient couch, so that up to 4 people can stay here. Use of washing machine and tumble drier without charge. There is a flatscreen TV and free WiFi internet access. This nice apartment is very bright and well equipped. 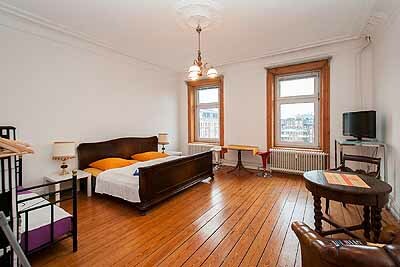 With 50 m² this 2-room apartment is big enough for up to 4 people. It's newly comfortably furnished with good quality parquet flooring. It has a sleeping area with a big double bed, a TV and a design couch. The nice living room is equipped with a big flatscreen TV and another couch for two more people to sleep on. The kitchen has a fridge, coffee maker, water kettle and a stove. There is also WiFi internet access available. This cosy 2 room apartment for 1-4 persons is located in the souterrain (with normal size windows) and is well decorated with warmly colored walls, nice pictures and modern furniture. The first room has two separate beds, the second room has a 160cm sofa bed. Both rooms have flatscreen TV. Furthermore it has a clean bathroom, a seperate toilet and a fully equipped pantry kitchen with a fridge, a stove, a coffee machine, a toaster and a water boiler. You can use the WiFi internet access and the washing machine and dryer for free. Apartments Hamburg Mitte - Ferienwohnung 7up! Are you a well-trained non-smoker who loves to climb stairs and needs only few luggage? In this case this huge flat under the roof with 130 qm for 6-10 guests (without lift) could be exactly what you are looking for. There are two bedrooms and two extra sleeping places on a second (plateau-) level built of a scaffold. From there you have a view over to Hamburgs St. Michel's church.The kitchen is fully equipped and disposes of a dish washer. The apartment has two shower-bathrooms (one with WC) plus a separate toilet, a huge dining table and a lounge area with a 50-inch LED-TV-screen. Wi-Fi internet is free of charge. 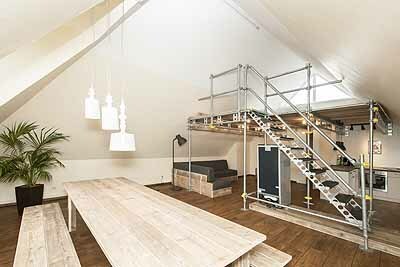 But please be aware that we are not exaggerating: heavy suitcases can hardly be carried up to the apartment through the very narrow staircase and the scaffold is a real one! 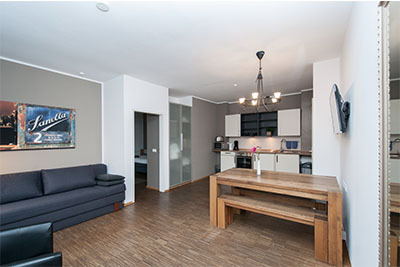 The bright apartment has two double rooms, a TV, a fully equipped kitchen and a simple bathroom. The smaller double room has a bunk bed, the bigger one two comfortable single beds. 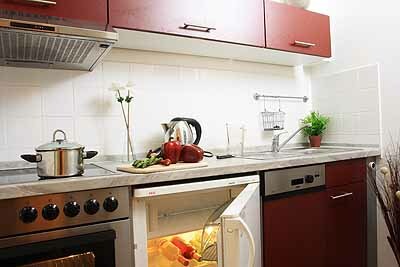 The kitchen is equipped with a fridge, a coffee maker, a toaster, a stove and an oven. You are living right in the centre in Hamburg, but the double-glazed windows will keep the traffic noises out of the apartment. Free Wi-Fi internet access is available. Smoking is allowed but windows need to be open. Your room is located in a beautiful ancient apartment with ceiling of 3,60m height, splendid stucco and original wood planks. It is equipped with a big double bed, a large TV, a cupboard and chair. 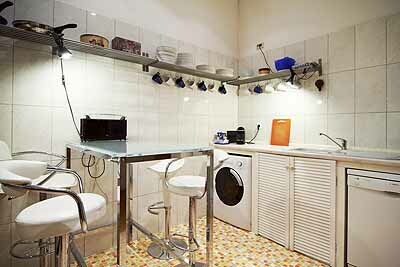 The fully fitted kitchen offers a dish washer, washing machine and coffee maker which are free of charge. WiFi internet access is also free. The two clean spacious bathrooms are shared with four other rooms and the landlady. Your room is located in a beautiful ancient apartment with ceiling of 3,60m height, splendid stucco and original wood planks. It's equipped with a single-bed, a TV, a cupboard and chair. 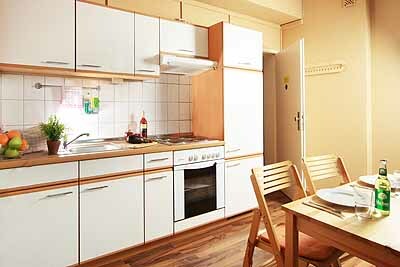 The fully fitted kitchen offers a dish washer, washing machine and coffee maker which are free of charge. WiFi internet access is also free. The two clean spacious bathrooms are shared with four other rooms and the landlady.